Not Finding what you Need or Want?!. Lay in place, step on it, locks together, wow! Beautiful, Quick, Easy, Versatile, problem solved! Easy to move, setup, and it's Strong and Great Looking! roll-over small images, and click in-order to see more. Real Wood top is spectacular and elegant. Unique 7 loop connectors, the most in the market place. Comes pre-assembled in 3’x3′ (18 lbs) sections, for easy of storage and assembly. 2 great Finishes; Dark oak, Light oak, parquet finishes can be combined. 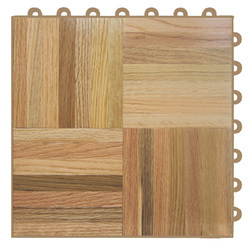 DanceDeck Deluxe Wood modular tile combines beauty of real wood along with water-resistant and lightweight features. 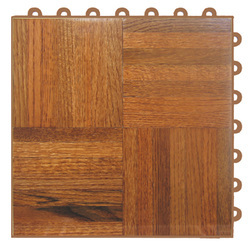 These tiles have real wood, oak parquet top that is inset into a durable strong polypropylene base. 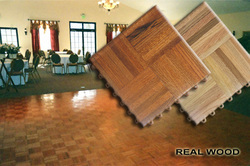 Create a spectacular real wood dance floor instantly anywhere and with only one person if needed. You can even combine the two finishes. Dance Deck Deluxe tiles sit up off the ground and allow moisture and air to flow underneath and away. They are unbelievably easy to handle and make a spectacular-looking and elegant dance floor. Great for indoor or outdoor use (avoid direct sunlight). Modular and very movable, create many different configurations for different events, flexible connections allow it to conform to uneven surfaces. The most connectors in the market for strong, even connections. The real wood fits down into the bases tray designed to protect the wood edges. DanceDeck is ideal for: weddings, dances, competitions, concerts, exhibits and other special events where an elegant wood floor is required. These dance floors have been featured on: American Idol, Good Morning America, Trading Spaces, The Tony Danza Show, Extreme Makeover: Home Edition, BRIDE Magazine. Actual size of tiles 1.01′ x 1.01′ x .787″. What size floor do you need? Also available in a Real Wood Surface – DanceDeck "Vinyl Tiles"
﻿Join, membership = your life Easier & saves you Money! ﻿Airomat is our Featured Product - One of the Best, We believe! This is our newest site... please let us know what you think. Sign up and SAVE MONEY, & forget about problems with purchasing Floor Matting forever. © Copyright 2012. JODYCORP LLC. All Rights Reserved.